Peden. There’s no better way to fly. Flying horses is the core business of Peden Bloodstock. We are highly experienced in moving horses internationally whether for competition, racing, breeding or re-location. Our priority is to ensure that your horse travels comfortably, safely and efficiently to their chosen final destination. Depending on the routing, number of horses and client preferences Peden is able to secure space on regular cargo line flights or alternatively charter an aircraft for the transport of your horses. We work with airlines throughout the globe to ensure that your horse moves as swiftly as possible to their final destination. 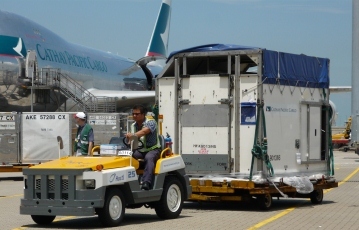 Many destinations of the world are served by carriers on a line flight basis however for those destinations where scheduled service cargo flights are not available or there is insufficient seating for attendants on the aircraft we will charter a suitable aircraft to meet your needs. Prior to the flight your horse will be loaded into an Air Stable which ensures that they are safely contained whilst on the aircraft. An Air Stable feels very similar to a horse box for your horse. The AirStable also allows the horse to be safely transferred to and from the aircraft. • HAY & FEED - Your horse will have access to hay throughout the flight. Should you wish your horse to be fed during the flight we recommend that a bran mash is provided for them. • WATER - Your horse will travel with a good supply of water which will be offered throughout flight. • AMBIENT TEMPERATURE -The temperature is maintained at 17 degrees during the flight which ensures comfort for the travelling horses. • RUGS - We recommend that your horse travels with only a light rug which should have the filet string removed to enable it to be easily removed during flight. • SEDATION - It is very unusual for a horse to need to be sedated in order to fly. Handled in the correct manor by experienced personnel even those horses that have never flown before are calm and relaxed and do not require medical intervention. • And with the best flying grooms in the world who will ensure your horse is accompanied throughout the journey.